OliverBenjamin - Dan Vinci Font - Write Backwards! DAN VINCI - Write secret coded letters! 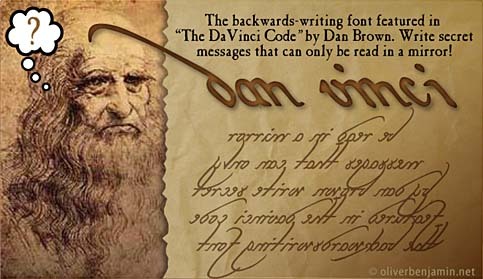 Dan Brown's hugely successful novel "The DaVinci Code" featured a special backwards font that could only be read in a mirror or against a light. With "Dan Vinci" you can write secret letters and private notes that no one but you can read! Includes an html file that reverses the order of the characters in your text for you, so that Dan Vinci can work its magic! Note: I am in no way affiliated with Dan Brown or his works. I like them though!